Providing you the best range of 103 video door phone and video door phone 104 with effective & timely delivery. Phoenix Video Doorbell 103 is a smart Video DoorBell that comes with a 7 inch indoor touchscreen which is installed at a convenient location inside your home. The doorbell connects to this touchscreen via simple 4-wire interface and achieves 2-way handsfree intercom between you and your visitor. Whenever a visitor presses your doorbell, you get a video call on your indoor screen. On accepting the call, you can see the live-video of your visitor and talk to him/her right from this screen. You can check who is at your door and you can also unlock your door by a click on this screen. The indoor screen has in-built memory and stores upto 100 visitor images with date and time of every visit. With clear night vision camera, you can also get on-demand surveillance and intercom of your home surroundings on your indoor screen. Answer your doorbell from 7” touchscreen installed in your home. Handsfree intercom: See and talk to your visitor conveniently and clearly from indoor screen. Unlock your door for your visitor with just a click on your indoor screen. Night Vision – See visitors clearly even at night with IR Vision Camera. Real-time surveillance of home surroundings from the screen, anytime. Power saving : Indoor screen provides power to outdoor bell unit. Indoor screen displays current date and time. Multiple settings: Ring volume, melody control, language and brightness settings. Inbuilt memory: Auto clicks and saves picture of visitor with the date and time of visit. You can view these records on your indoor screen. Sleek design and easy installation. Additional indoor screens with all features, can be easily installed. Power Supply 12 V DC, 1A. Phoenix Video Doorbell 103 is a smart Video DoorBell that comes with a 7 inch indoor screen which is installed at a convenient location inside your home. The doorbell connects to this screen via simple wired interface and achieves 2-way handsfree intercom between you and your visitor. Whenever a visitor presses your doorbell, you get a video call on your indoor screen. On accepting the call, you can see the live-video of your visitor and talk to him/her right from this screen. You can check who is at your door and you can also unlock your door by a click on this screen. With clear night vision camera, you can also get on-demand surveillance and intercom of your home surroundings on your indoor screen. 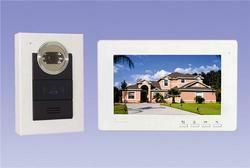 Answer your doorbell from 7” display screen installed in your home.